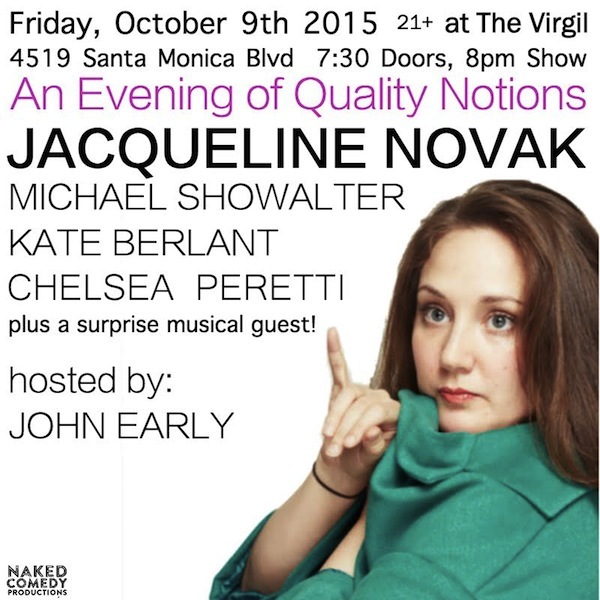 Friday, October 9th, New York comedian JACQUELINE NOVAK makes her Los Angeles debut at a ONE NIGHT ONLY show at The Virgil. John Early (Meltdown, WHAS First Day of Camp) will be hosting this magnificent event. Jacqueline will be also joined by Michael Showalter of Wet Hot American Summer, Brooklyn Nine-Nine’s Chelsea Peretti, and Kate Berlant who’s dazzled you on @midnight. Ms. Novak is a NYC-based stand-up comedian and writer whose self-produced comedy album Quality Notions debuted at #4 on iTunes. She is one of the hosts of the CakeShop Comedy show in NYC and her first book of humor non-fiction HOW TO WEEP IN PUBLIC is being published by Crown in March 2016. Get on the Novak bandwagon, LA! Mentions: Doors: 7:30pm, Show: 8pm. FREE!!! The Virgil is located at 4519 Santa Monica Blvd, Los Angeles. Pick up a copy of JN’s “Quality Notions” online at JokesNovak.com and on iTunes.